The biggest complaint I hear from teenagers is that we don't take them seriously. 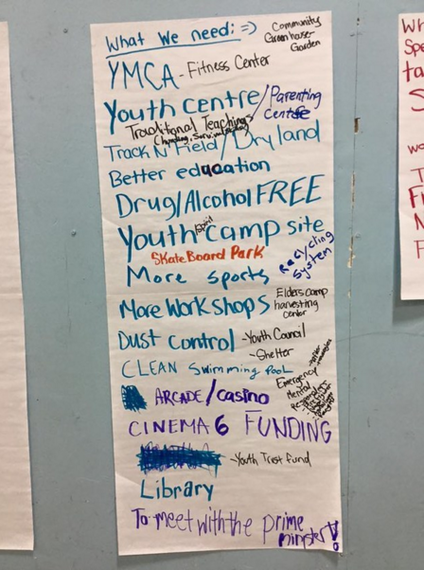 The teens of Attawapiskat have made a list of what they have in their community, their community and social assets if you will. Things like a gym, a Healing Lodge, and a school. They have also made another list: 'What we need.' Notice the list was not titled what we want. Need. These children need a Fitness Centre; it was the first thing on their list. The second was a Track and Field facility. More Sports, a Youth Camp and a clean Swimming Pool. We need to listen now, and give them what they need before it's too late. My heart swells when I read about the youth of Attawapiskat and the recent suicide pact that was thwarted by the quick actions of police, local services and community. I am the mother of four teenagers ranging from 16 to 20 years old. These teen years are tricky ones. I have only to look at my 6 ft "7" boy who most definitely looks like a man, and I think, yes, he is almost a man. And then he growls at me in frustration over a lost Internet password, or he lashes out in anger with his sister. Boy/man. That's what he is, half a boy, half a man, navigating this gap between childhood and adulthood, navigating a time full of increasing responsibility. Increasing awareness that there is a future beyond the parental home and navigating some of life's big questions. What will I be studying at school? Will my grades get me into college or university? What am I going to do with my life? Who will my friends be in a year or two? Who am I outside the family unit? Even excluding hormonal changes, and brain development, these kinds of questions and uncertainty would stress most adults to the extreme. You have only to glimpse at the news stories, to know that the children and teenagers of Attawapiskat are dealing with so much more. They have the cards stacked against them: Poverty, isolation, lack of good educational opportunities, and the legacy of colonization and discrimination. We cannot turn our back on these kids, they are indeed some of our country's most vulnerable citizens, and yes, it is our job as Canadians to look after one another. This is the foundation that makes me proud to be a Canadian; that we care about a larger world, and we passionately care about one another regardless of race, religion, and cultural differences. In the case of these children in Attawapiskat, we need to care even more; these are Canada's first people. I believe Canadians want to help; the government debated for five hours today about what is to be done. Maybe we need to look at what the teenagers of Attawapiskat are telling us. Raising teenagers I have witnessed how they often hold the answers to the very questions that most perplex them. Teenagers may just need some guidance to access these answers, to believe that when they speak they will be heard. The biggest complaint I hear from teenagers is that we don't take them seriously. 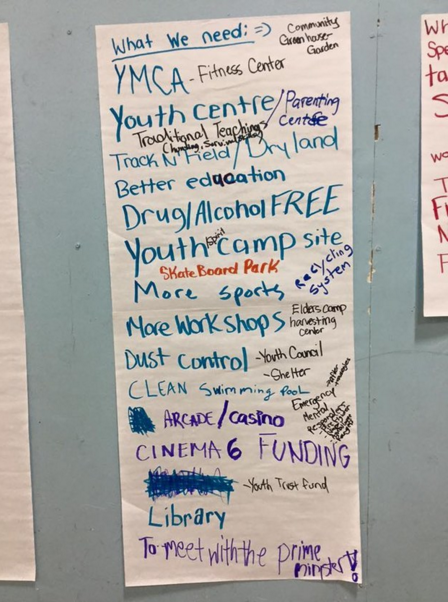 The teens of Attawapiskat have made a list of what they have in their community, their community and social assets if you will. Things like a gym, a Healing Lodge, and a school. They have also made another list: 'What we need.' Notice the list was not titled what we want. Need. These children need a Fitness Centre; it was the first thing on their list. The second was a Track and Field facility. More Sports, a Youth Camp and a clean Swimming Pool. These children and youth seem to intuitively know that moving their bodies will make them feel better. They may not understand the brain science of depression and mental illness, they may not understand about endorphins, serotonin, and the mind body connection, but they know that playing makes them feel good. As you might imagine, for someone who has advocated for the importance of sport and play for most of my adult life, I know the power of play to change children's lives. For over a decade I volunteered with Right to Play and saw first hand the transforming power of sport and play in some of the world's most desperate places. I saw how well-executed, community supported sport programming, could build resiliency in the community, I saw how with leadership, young people could rise above their circumstances and become leaders and role models for their community, I saw how sport built hope in war torn areas, in villages where abject poverty was a daily reality. I see the power of play and sport, every time I see a child experience the joy and pride in mastering a new skill, in scoring their first goal, in standing on skates for the very first time. Please don't get me wrong, I don't think sport and play programs can solve everything, I just think they are a big part of what kids need to feel good about themselves, to feel connected to their bodies, to feel a sense of joyfulness that is necessary in building hope. Right to Play developed a PLAY program that has engaged over 3,000 Aboriginal children and youth. Their youth-driven model develops leaders and capacity in the communities they work in. We need more of these kinds of initiatives; we may well need a program like this in Attawapiskat. Maybe these kids know what we find so difficult to articulate. Maybe these kids intuitively know they need to feel hope, they need to believe in a future. What they are asking for seems within our abilities to give them, the question is, are we listening? This article originally ran on Buzzfeed.